Squidge fast asleep at 7am in his sleeping bag, it was so horrible waking him up! I work 4 days a week, Mon-Thurs and each day we’re out of the house pretty early, usually when it’s still very cold. Each morning we drop Squidge off at his grandparents (Teddy Bears and Cardigans) before heading to work. 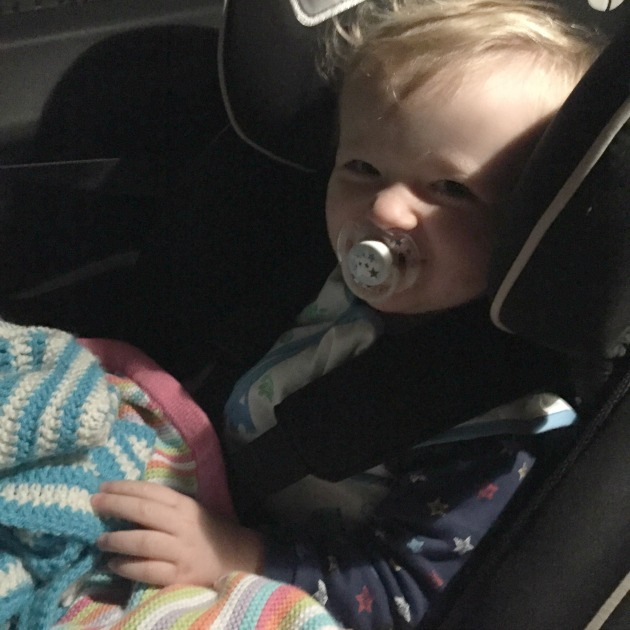 But we were struggling to keep him warm in the car – even with putting 3-4 blankets on him to keep him cozy. 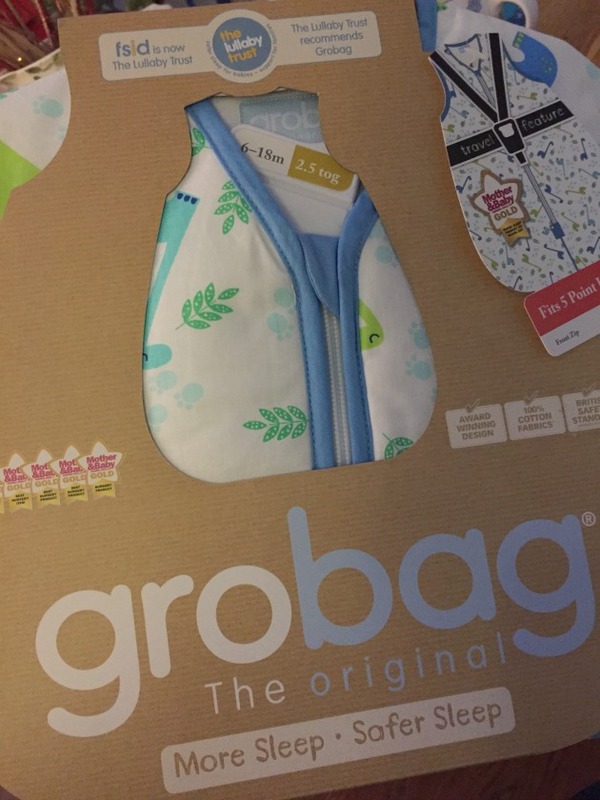 Back in December I discovered that Grobag sell something called a Travel Gro Bag – it’s a sleeping bag that you can use with a car seat – there’s a hole (covered by a flap) at the front and back so you can harness them into a seat safely. We thought we’d give it a go – it can’t be worse than the blankets? Of the sleeping bags we have for Squidge, the Grobag Travel is by far the nicest. It’s thick and beautiful quality. The cotton is really soft. I’m also totally in love with the pattern on the front (dinosaurs). We opted for a 2.5 tog as we were heading into Winter at the time, and his room can get quite nippy in the middle of the night. It costs £29.99* for his size, and you can really feel the difference in quality compared to the £15 supermarket ones we’ve used before. It took a few go’s to get the hang of getting the strap through but as long as you make sure the sleeping bag isn’t bunched up on your little one it should be easy enough. Once strapped in, he feels really secure, I’m confident he’s not going anywhere! Most importantly, he arrives at his grandparents nice and warm and cozy J He’s starting to grow out of this one and the weather is warming up, so we’ll be purchasing the next size up soon, but in a 1 tog ready for Summer. A lot of the time on my blog, I sit on the fence and try not to be too controversial (I'm really not a fan of drama). 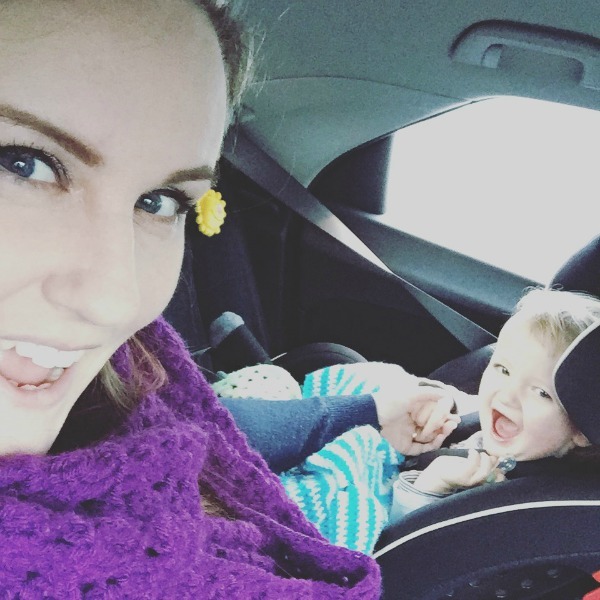 However, the ‘let babies cry it out’ attitude and method is something I feel so passionately about, I felt I had to commit virtual pen to paper to share my thoughts. First off as a disclaimer – this is only my opinion I’m expressing, everyone is free to raise their children how they see fit, I’m simply expressing my opinion against this method. The ‘cry it out’ (CIO) method has been popular among new parents for some time. I won’t name names, but when Squidge was only 5 weeks old I was told I was spoiling him by picking him up when he was crying. I was shocked that someone would think a mother picking up their crying newborn baby was ‘spoiling’ them… spoiling them with what, love? It felt like the natural thing to do, ignoring him would have been unnatural. 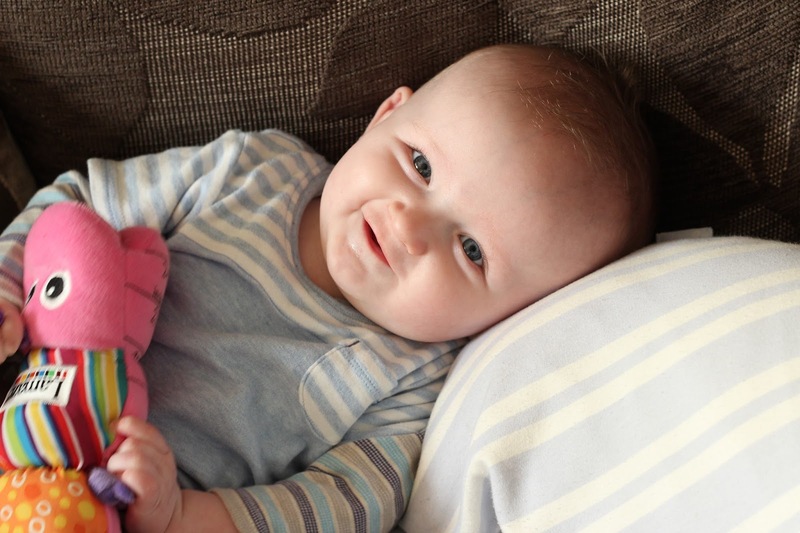 A few of our friends who are parents also suggested the CIO method when Squidge was struggling to sleep at night. 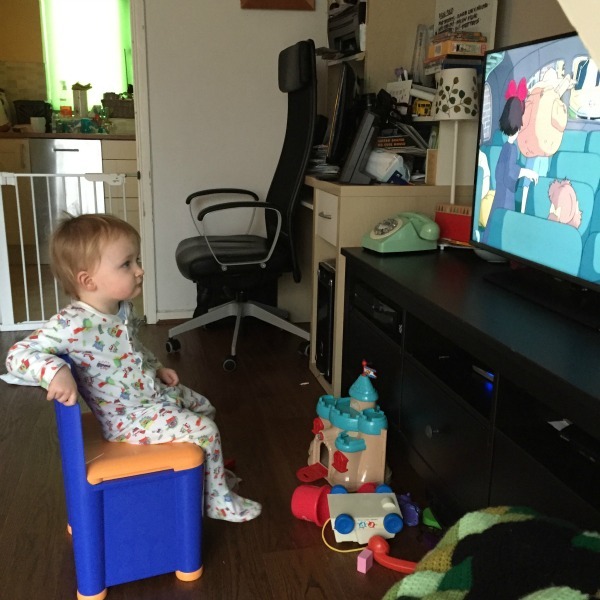 Fundamentally letting a baby CIO is both highly distressing for the parents, and the baby. It’s not something we’ve done with Squidge and certainly wouldn’t do with our next child. 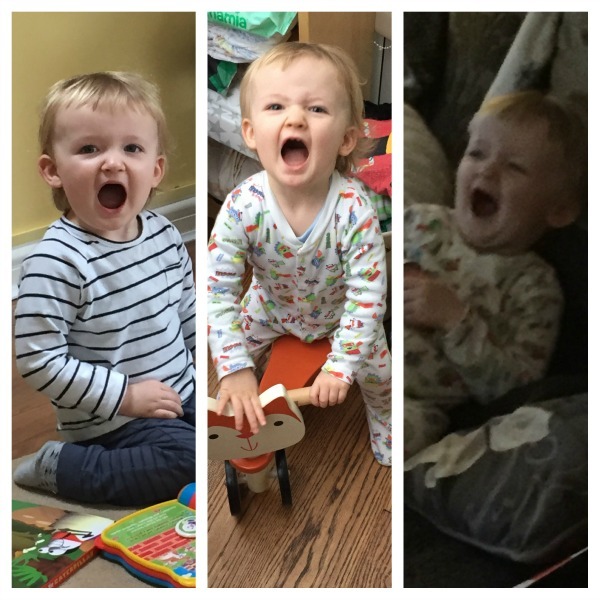 That’s not to say you need to go running to them the second they make a sound – from experience we know Squidge’s cries, and often when they’re more whiney he will naturally settle himself and isn’t crying out for us. On those occasions, we’ll wait a moment to see if he sounds like he’ll settle, if not we’ll go straight in and comfort him. But I stress, they are whines, not cries. If he cries, I go to him. There’s been studies published recently that talk about why the CIO method is so detrimental to a baby. They learn that no-one will come when they cry, whether they’re crying through fear, nightmares (babies start getting nightmares when they’re just a few months old) or needing comfort with a cuddle. It also hinders their brain and emotional development. The study found that babies who were picked up when they cried weren’t as clingy and were emotionally healthier. They found that adults who’d been let to CIO as babies had more social anxiety, a poor memory and physical symptoms such as IBS. A study published in 1994 also discovered that babies who were picked up when they cried grew up to be more independent than their counterparts who were let to CIO. I know how hard it is with a young baby, it’s beyond exhausting and your arms ache from holding your little one, so any few minutes you can steal for rest you do. But I urge you not to let them cry it out. If your arms are tired, put on a sling so you can go hands free, even just for in the house (Squidge would love being wrapped up in a sling) - they'll thrive on the contact. You can read more about the study here by Dr Narvaez. I feel so strongly about this, going to a crying baby feels right because it is right! It’s been a while since I’ve put a Squidge update on here... no wait, it's been a while since I've put any post live on here for ages! Anyway, as he’s just hit 16 months old I thought I’d share a little update with you all. It’s so hard to believe that in 2 months time he’ll be a year and a half old! I’ve already started collecting his next-size-up clothes for him as he’s starting to grow out of some of his 12-18 months ones (mostly tops as they’re struggling to fit over his head) and some trousers. But saying that, he still wears some 9-12 month clothes too. He’s coming on leaps and bounds. He’s been walking for 5 months now and is really steady on his feet. He’s becoming such a gentle and affectionate little boy, it’s just the loveliest to see. He regularly gives us kisses and cwtches up to us resting his head on our shoulder. But he’s also not a pushover. If another toddler shoves or hits him, he’ll seek them out and shove them back :P I love that about him, I love that he sticks up for himself – not something we’ve taught him to do yet either. I don’t want to write this because I feel I’ll jinx it, but he’s become a really great sleeper (OMG, I drafted this 4 days ago, that night (Weds) he was awake nearly all night! I had 2.5 hrs sleep... and then the same again the next night! I actually jinxed it!). He’s pretty much slept through every night for the last 3 weeks now, only waking up a couple of times in a couple evenings for his dummy. But I’m also painfully aware that the 18 month sleep regression is looming! 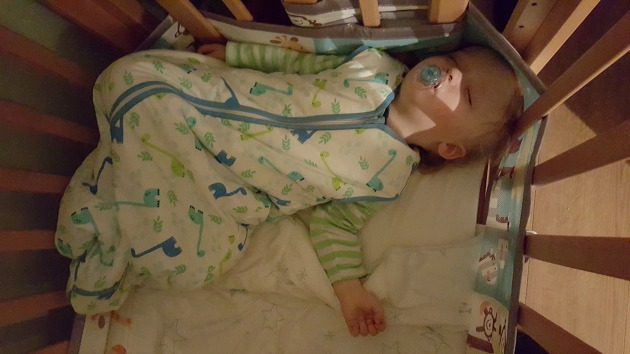 He’s still in his cot and still in a sleeping bag. I’m not planning on changing that until he can climb out of it, and at that point we’ll just put the side of the cot down and put a stair gate on his room. He’s still far too mobile for a bed (he does laps of his cot when he sleeps!). Stuck - this one is really amazing. He doesn't just understand the word, but the concept. He'll say stuck if his foot gets caught in the cot, or if a toy is caught on a chair, or if his fork gets caught on his bowl - so clever. There's loads more, but they're the main ones :) He's also really good with animal sounds, so far he can do: Monkey, Lion, Dog, Cat, Pig and Horse (he does the click, clack with his tongue for that). Every day he makes me proud. The way I see him play with other children, how smiley and gentle he is, and how affectionate he is. I could never have hoped to have such a great child, and for the most part, he's really well behaved too. He plays up a little if he's really tired, but that's it.